Windows 8 makes it easier than ever to restore, refresh and recover your OS. In fact, it’s easier than ever before to get Windows 8 working than any of its predecessors. 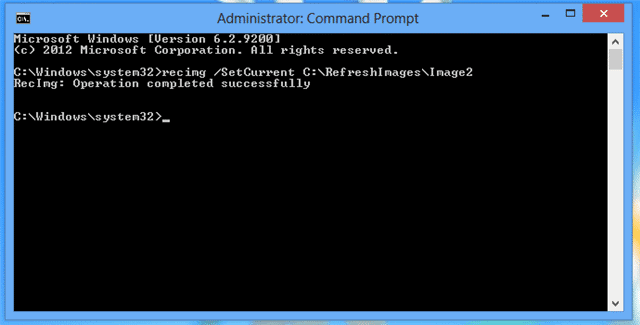 You can create custom recovery images in Windows 8 via the command prompt, and it’s a pretty simple process. Custom recovery images save your computer in it’s “as is” state. That means however your computer is set up currently, including files, folders, drivers, settings and more can be saved in a custom recovery image to use if something goes wrong. If you’re looking to create a custom recovery image, you should do so after a refresh of Windows 8. After that refresh is done, you can update your system, transfer your files and folders, along with setting it up the way you want. Then, you can create the recovery image to ensure the Windows 8 you want to recover is the Windows 8 you get during the process. This process allows you to overwrite the default system recovery image created by Windows to something more valuable to you down the line (More valuable since the new image you create has all your app installs, settings and latest files as opposed to the default one which is like a new Windows install). Let’s see how it works. 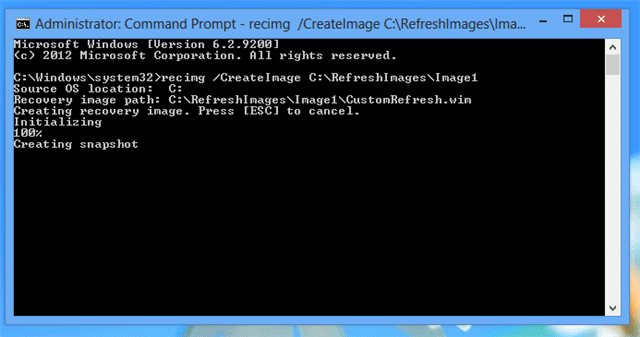 Before you begin creating custom recovery images, make sure you refresh Windows 8. Then, perform Windows Updates, driver updates and uninstall default apps to set up the system exactly how you want it. When you’re ready, then proceed with creating your custom recovery image with the following steps. 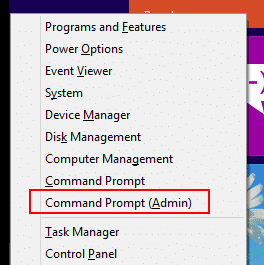 Click on “Command Prompt (Admin)” to open an elevated Command Prompt. 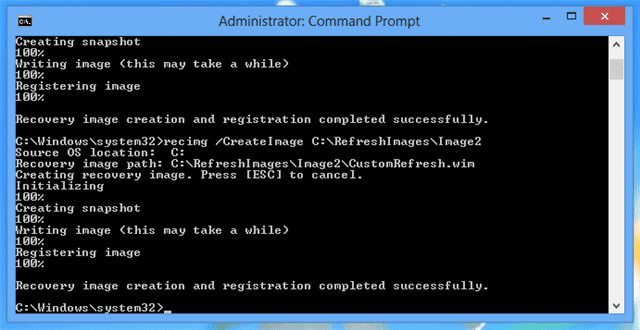 You can only create and work with custom recovery images by using the elevated prompt as Administrator. You can change the directory to anywhere you want and name it what you want. You can also change the name of the image afterwards to whatever you like. The recovery image will begin to be created. It’s best for you to walk away and let your PC complete the process without interference. When finished, you’ll be told. Now, if you ever need to recover Windows 8 with a recovery image, it’ll be recovered with the custom image you just created. You’re able to create multiple custom recovery images for a variety of reasons, let’s take a look at that process and how to switch back and forth between them. Let’s say, for whatever reason, you want to create several custom recovery images. You can do that through the Command Prompt, too. Again, you can change the location of the recovery image as well as the name. Ensure it’s not the same name as your first custom recovery image, otherwise you’ll overwrite it. Let your PC create the image and when finished, you’ll be able to switch back and forth between the images as necessary. Change the location where the images are stored as well as the name to what you want your system to use as the default custom recovery image. 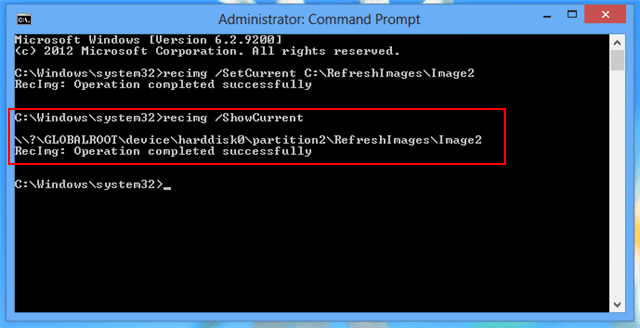 Windows 8 will now use whatever recovery image you designated as the default one in the future. You can change this at any time through the elevated Command Prompt. Now, you’ll see which custom recovery image is set as default. You can then change it with the above steps as you see fit. This will resort back to the original recovery image that came with your PC. Depending on how you installed or upgraded Windows 8, or even if you bought a new computer, this image will vary from machine-to-machine. If for some reason your system can’t find a recovery image, it’ll ask you to insert your installation media or disc to set one. Without a custom recovery image set, as long as a default recovery image is on your PC, Windows 8 will always refer to that one until you tell it do so otherwise with the above steps. 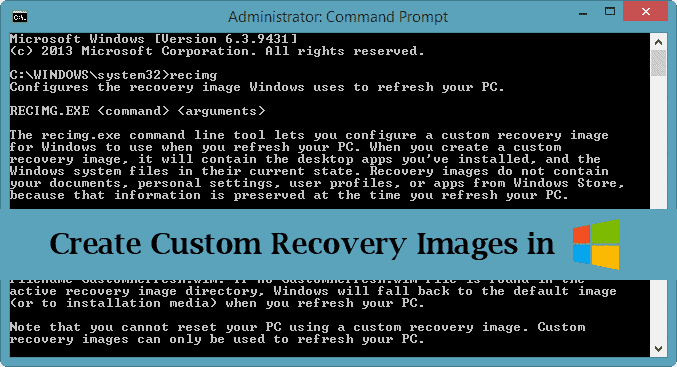 Custom recovery images are the way to go on any Windows PC that supports it. Windows 8 makes it so much easier than ever before to do this, and every Windows 8 users should take advantage of this option. Using the Command Prompt isn’t as scary as it seems, even for novice computers users, and this guide will help you get started. A custom recovery image makes it possible for you to restore your PC in the event of a disaster without wasting time reinstalling all your programs, apps, drivers and updates. Until something goes wrong and you have to start from scratch, many PC owners don’t realize how much time it takes and how frustrating it can be. Make use of this highly useful feature to back up your Windows 8 OS in it’s current state today.